Today, November 10, 2014 we celebrate the United States Marine Corps’ 239th birthday. Tomorrow is Veterans’ Day when the United States honors all who have served in the US Armed Forces. Below is a photo of my grandmother who bore twelve children, eleven of whom lived to adulthood and some of whom she watched with her steadfast fortitude and optimism as they left town on their way to distant battlefields. 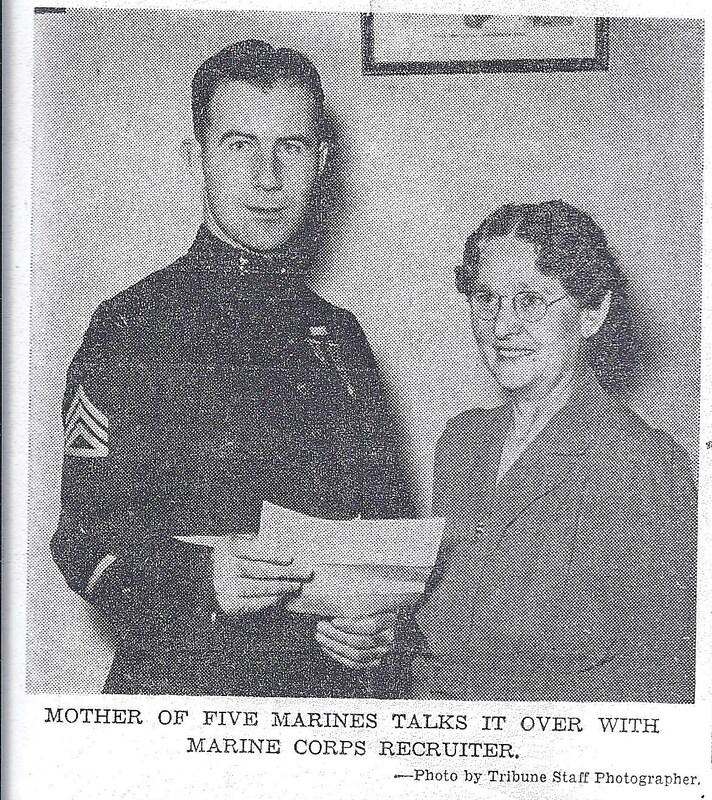 During World War II, four sons enlisted in the Marines and were deployed to the Pacific Islands while one daughter enlisted and was stationed as a Marine recruiter in Chicago. Grandma also had two sons-in-law deployed in the Marines and Air Force, and a younger son who later joined the Marines. 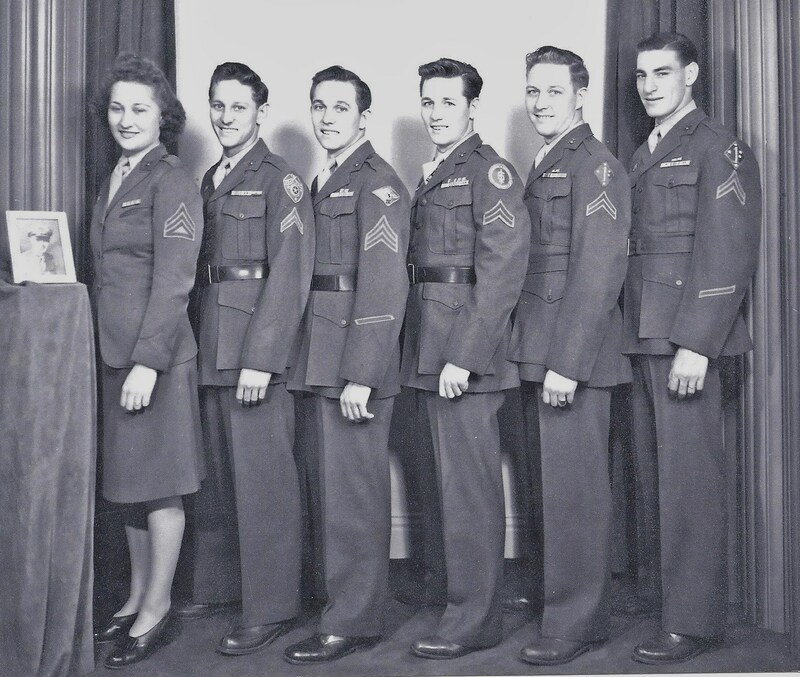 During her sons’ deployments, Grandma – along with so many other women on the homefront – worked at Clark Equipment Co., a manufacturing plant that assisted in military support by transitioning its manufacturing lines to produce heavy duty lift trucks and towing tractors for overseas missions. As a tribute to the Marine Corps birthday and Veterans’ Day, I’d like to honor Uncle Pep and a veterans’ organization – the American Legion – because they were an integral part of my childhood. Small town life in the 1950s centered around school, church and a few civic organizations. For my family, that organization was the American Legion. That was a phrase heard often in our house and those of my many cousins. The Legion – a nondescript one-story blond brick building with a large social hall, roomy kitchen with a pass-thru window and serving counter, and two single stall bathrooms – was located on the way out of town on our steepest, longest hill. For me as a child, both the hill and the Legion loomed large. Hence ‘up at the Legion’ was said with reverence not only because the Hall itself held such allure, but because of its ‘majestic’ setting. I don’t think there was ever a time I was ‘up at the Legion’ and didn’t see Uncle Pep. I thought he owned the Legion. Or at least lived there. Uncle Pep always seemed to be surrounded by my Dad, Uncles and other men – talking, playing cards, giving each other grief. His nickname fit him perfectly; Uncle Pep was exactly that – full of energy, enthusiasm and a twinkle in his eye. No matter the event, he was always in the thick of it – setting up tables and chairs; cooking up something on the stove; washing pots and pans; doling out the decks of cards – all the while making sure everyone else had what they needed and felt welcome. Because we held so many family functions ‘up at the Legion’, I thought of the place as simply ‘our’ gathering place, not making the connection to the Legion’s true purpose. Sure, Uncle Pep, Dad and other men wore those odd-looking hats. And every Memorial Day and 4th of July, we – the adults in their military uniforms and kids in Boy and Girl Scout uniforms – met ‘up at the Legion’ to begin the parade that marched through town to the cemetery. Afterwards, we reconvened ‘up at the Legion’ for crowded picnics and games that lasted well into the night. But I didn’t realize the haven that Hall provided for the men and women who came home from WWII struggling to fit back into ‘normal’ lives; learning how to move past the flashbacks and nightmares that could be shared only with those who’d marched through the same hell. If you’ve seen the HBO series The Pacific, you know some of what these men endured. Guam, Saipan, Iwo Jima, Okinawa and Peleliu – places etched deeply in their souls because of the young friends and comrades they lost in battle, not to mention their own gruesome actions on missions of unspeakable horror. Dad and my Uncles were fortunate to all come home from the war, but no one comes home without wounds and lasting scars. The American Legion (http://legion.org) was chartered by Congress in 1919 after World War I to focus on serving veterans, servicemembers and communities. In my small town, the Legion served us well. It continues to do so in numerous communities across our nation. Uncle Pep passed away a couple years ago, having lived a fully engaged life until age 90. For four of those years, he was an active duty Marine. 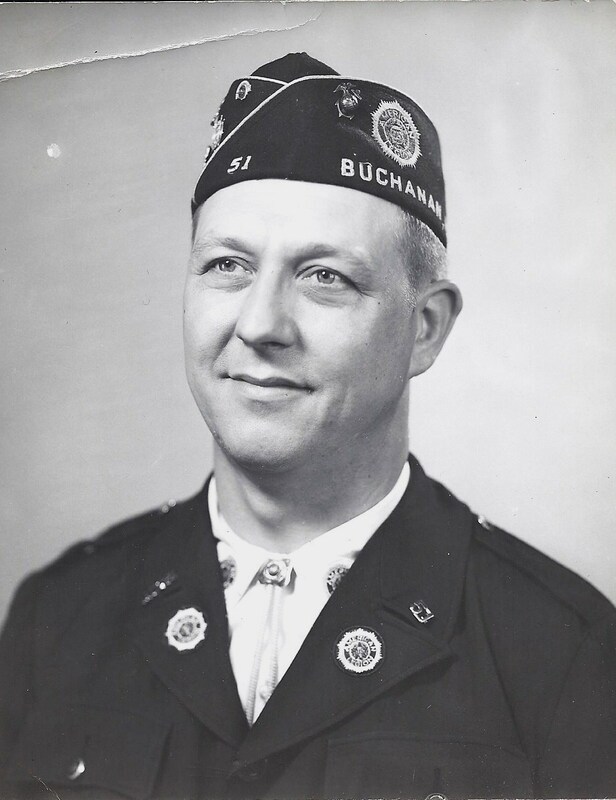 For approximately 65 years, he was a veteran and proud, active member of the American Legion. You military veterans and your families have my highest praise, my deepest gratitude and my steadfast support.